Second theory by Ben Anderson. In his theory, Ben Anderson said, the suspect G 30's is because of a conflict in the army. The motives of the reason this is a group of officers 'progressive' that comes from the Division Diponegoro feel is not satisfied with the luxurious way led by the Army in Jakarta that he thought was not in accordance with the spirit revolution. The army was to be removed so that political Sukarno can continue. Moreover, the Council General is considered to be critical market coup against the government of president Soekarno. Third theory by sociologists and Dutch historian W. F. Wertheim. He said, the suspect G 30's is the Army and Suharto. Soeharto want to beat PKI, replacing Sukarno and remove the strongholds in another AD, and become heroes and the President. Suharto is a person who is known as a person who led the operation inhabited for rebellion G 30 S.
The four theory by Peter Dale Scott. He said, the suspect G 30 S involving foreign parties, the CIA, the United States of America. The reason for this in it was during the cold. Soviet Union and the United States vying for influence in the world. Especially in developing countries. Indonesia is the strategic, and the potential for their interests. There is a theory dominoes, who said that when a territory be used ideological opponents, then the area around it will follow ideology. Therefore, Indonesia would have to follow an ideology. Fifth theory by Anthony C. Dake. He said that the perpetrators G 30's is Sukarno. 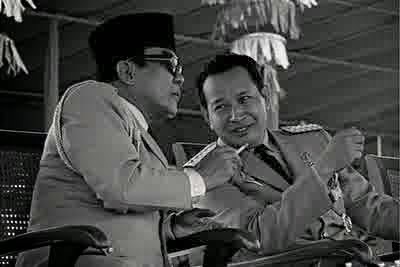 Sukarno as egoist and thirst for power, so he wants to do away with military opposition. Another opinion, said Sukarno was a marxist who wants to build communism in Indonesia. 0 Response to "Five Theory about September 30th Movement"